Flynn Carsen: Well, I've read a lot of books. Charlene: Don't try to be funny. I don't do funny. Charlene: [after a pause] What makes you think you could be the Librarian? Charlene: Everybody knows that. They're librarians. What makes you think you are the Librarian? Flynn Carsen: [confused] I know other stuff? Q: Is there really such a thing as the "language of the birds" or was it made up for the movie? Q: Any recommendations for other movie series like the 'The Librarian'? Q: What are the differences between the TV cut and the extended cut? First part of the Librarian series with lots of entertainment and fun.This outing in the popular ¨The Librarian franchise ¨(1ª Quest of the spear-2004- by Peter Winther, 2ª Return king Salomon's mines by Peter Winther and 3ª The curse of the Judas Chalice-2008- by Jonathan Frakes) concerns on Flynn Carsen(Noah Wyle), the roughest, toughest,silly, and botcher hero with 22 university degree . Flynn receives a note from a strange book captioning that has been selected to an interview at the public Metropolitan Library. 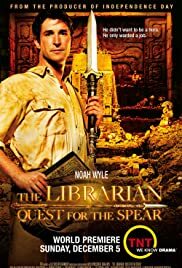 Flynn is appointed as the new Librarian and assigned missions around the world and recover priceless objects guarded into Metropolitan library where are the Sacred ark, Lance of Longinus, box of Pandora, Arthur's Excalibur blade, the skull of crystal, Saint Sheet of Turin, the magic flute, among others. Meanwhile Flynn is having problems , he just doesn't time for his life and relationship . Now he must find the lance of Longinus which holds supernatural powers and has been robbed by the serpent's brotherhood . He goes to Amazons jungle looking for tracks .Flynn accompanied by a beautiful adventurer (Sonya Walger) discover a Maya temple and later on they head to Himalaya where allegedly is the lance hidden by Tibetian monks. Our unpredictable heroes risk their lives against a set of the ambitious villains (Kyle Machlahan, Kelly Hu) you've ever seen. Entertained TV movie plenty of action-packed,tongue in cheek, adventures, love story and extremely funny. This one has a little bit of everything : rip-roaring action, thriller,Sci-Fi,fantasy,derring do and an exciting score by Joseph LoDuca. Along with a sympathetic Noah Wyle appear the habitual secondaries, as a deadpan Bob Newhart,a serious Jane Curtin and his likable mother well played by Olympia Dukakis. Besides Kyle MacLachlan as former Librarian. This enjoyable picture combines splendidly ¨Riger Haggard's mines of King Salomon¨ with ¨Spielberg's Raiders of the lost ark¨. Spectacular final scenes with excessive and mediocre use of computer generator special effects, adding a colorful cinematography by Alan Caso. For utter spirit-lifting bemusing you can't do better than this television movie. The picture is lavishly produced by Dean Devlin in partnership with Noah Wyle and TNT and efficiently directed by Peter Winther. Rating : 6,5, worthwhile watching.